Wether you are a high stakes or low stakes bingo player, Cheeky Bingo has the games for you. Games start from FREE (with real cash prizes) and 1p games are available with £50 jackpots. Every friday CheekyBingo.com run a £5,000 GTD game at 8pm. Games include 75 and 90 ball bingo as well as a nice range of progressive slot games and casino games including blackjack, roulette, slots and video poker. At Cheeky Bingo you can play for free and win for real! Sign-up now and you can enjoy one of Cheeky’s 6, that’s right SIX, free bingo roomswithout spending a penny! Pop into the Big Freebie room an you could even pocket a guaranteed jackpot of £50 for free! To experience all that Cheeky has to offer make sure you claim your 200% Welcome Bonus! After your first deposit bonus, Cheeky will give you a 50% bonus every time you top up your Cheeky Bingo account with £10 or more! You can also collect cheeky points by playing in more games or refering your friends, these cheeky points can then be turned in to cash to play on the tables. 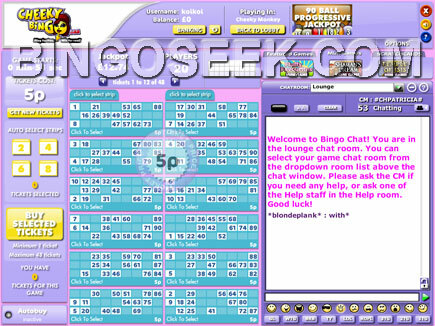 Currently cheeky bingo has 6 Free bingo rooms running all day every day!